A dog food bowl raised to the proper height allows your pooch to eat without stooping or stretching. Veterinarians believe that deadly bloat may occur in dogs who eat too fast, the website VetInfo notes. 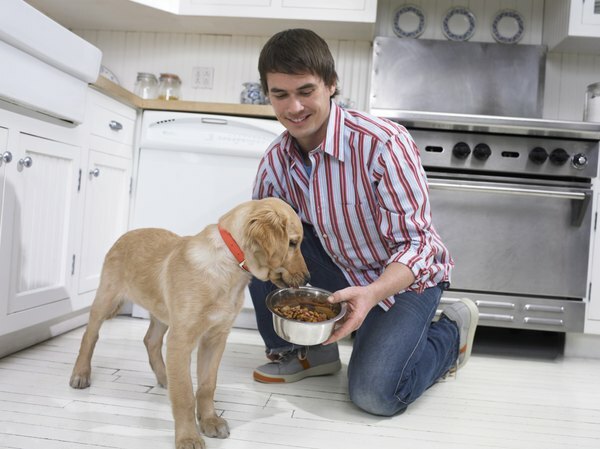 Raised dog food bowls may promote faster eating. Bloat is more common in large, barrel-chested dogs. It also occurs more frequently in male dogs and in dogs with relatives who have had bloat. Talk to your veterinarian if you're concerned about your dog's risk and eating habits. How Much Should I Feed My Maltese Puppy? Does the Size of a Bowl Matter for a Puppy? How High Should a Dog Bowl Be? Should Boxer Dogs Eat From Raised Food Bowls?